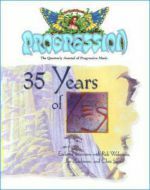 Here we have a selection of special issues including three "mini-magazines" published by Progression dedicated exclusively to individual progressive bands Emerson, Lake & Palmer, Gentle Giant and Yes. Also available are the last remaining copies of legendary progressive-metal/prog-rock magazine Sea of Tranquility, published by late Progression Art Director James Bickers. All special issues are collectible items in limited stock. Prices are postpaid to addresses in the United States and its territories. Special issues ordered from outside the United States are sent airmail at a rate of $7.25 per single issue ordered.